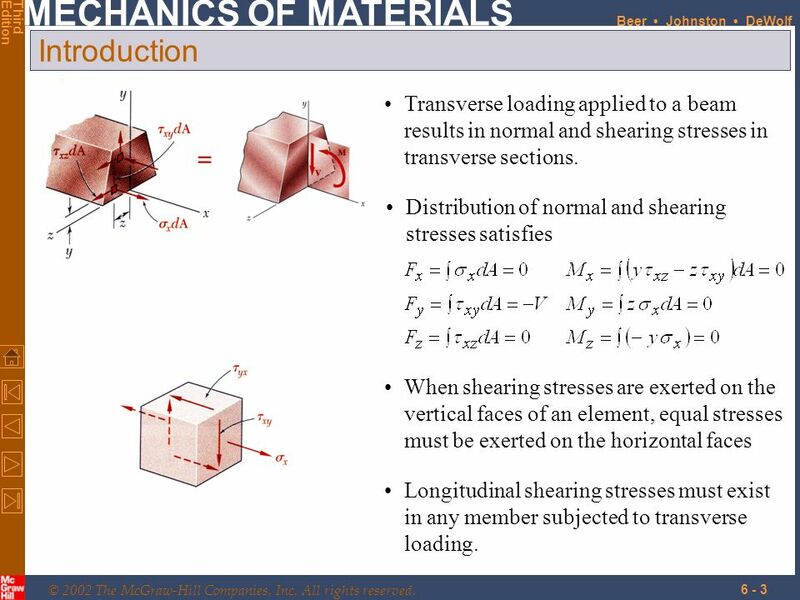 3 Introduction Transverse loading applied to a beam results in normal and shearing stresses in transverse sections. 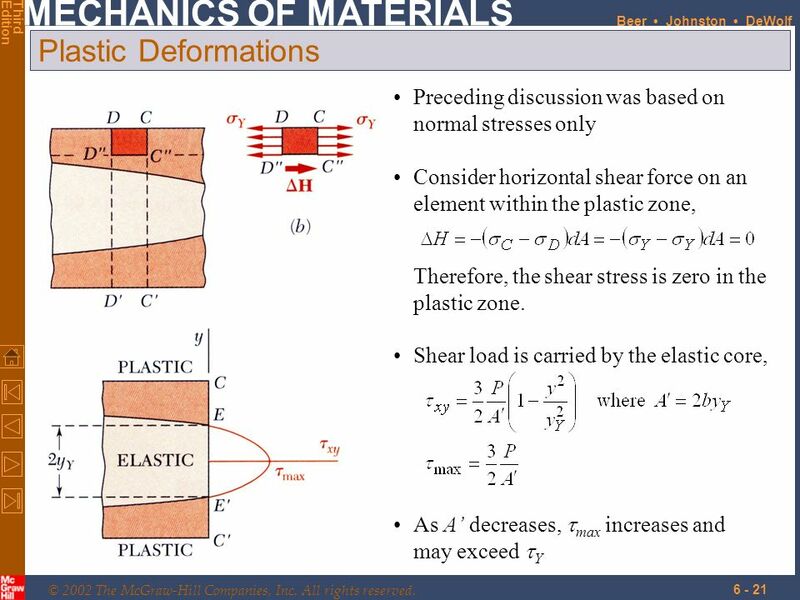 Distribution of normal and shearing stresses satisfies When shearing stresses are exerted on the vertical faces of an element, equal stresses must be exerted on the horizontal faces Longitudinal shearing stresses must exist in any member subjected to transverse loading. 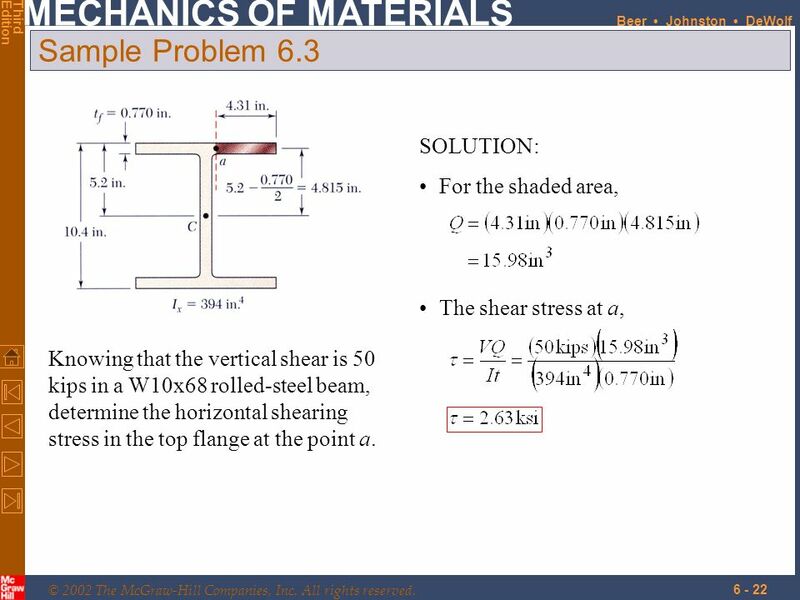 6 Example 6.01 SOLUTION: Determine the horizontal force per unit length or shear flow q on the lower surface of the upper plank. Calculate the corresponding shear force in each nail. A beam is made of three planks, nailed together. 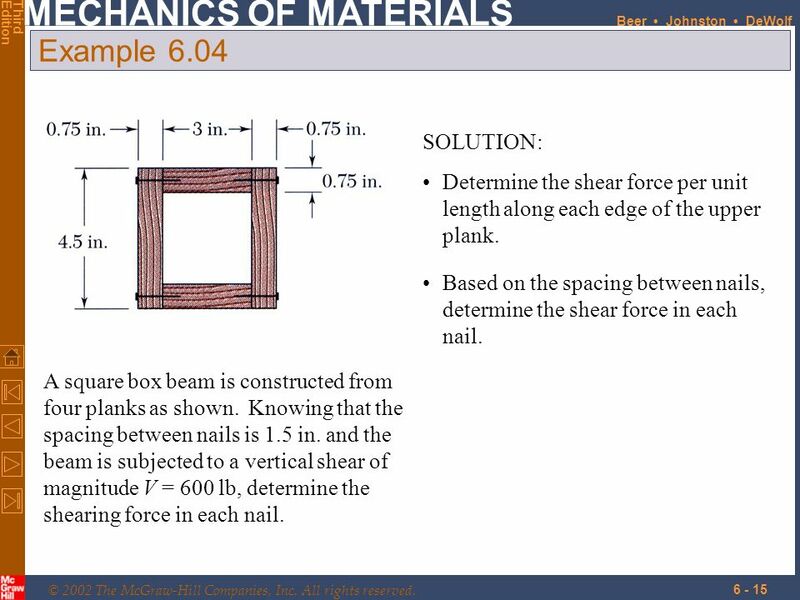 Knowing that the spacing between nails is 25 mm and that the vertical shear in the beam is V = 500 N, determine the shear force in each nail. 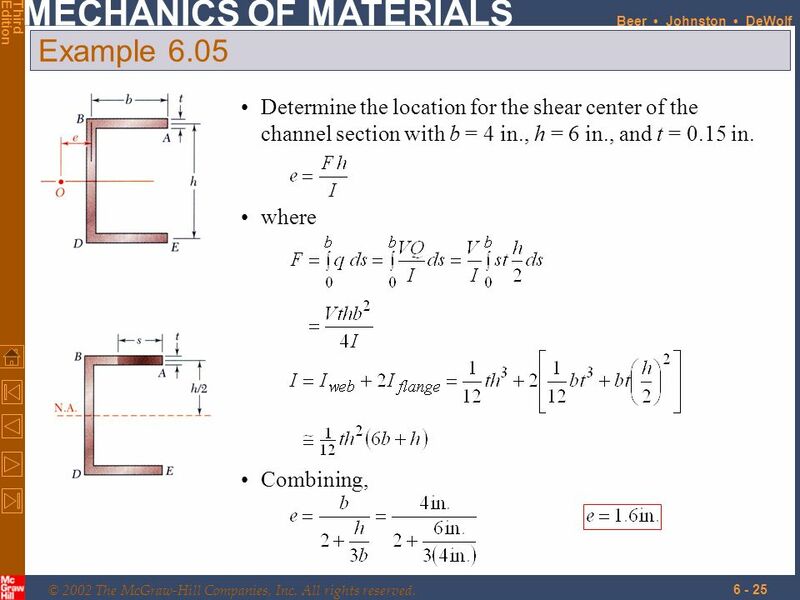 7 Example 6.01 SOLUTION: Determine the horizontal force per unit length or shear flow q on the lower surface of the upper plank. 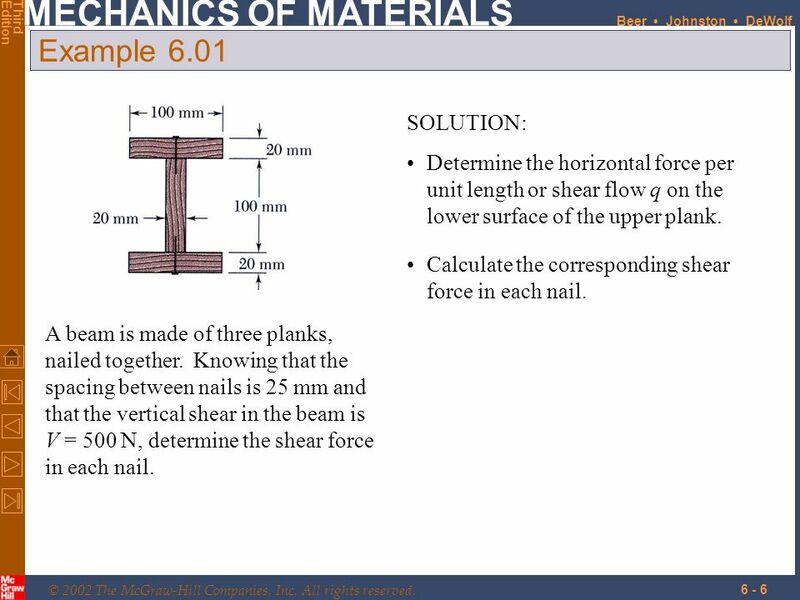 Calculate the corresponding shear force in each nail for a nail spacing of 25 mm. 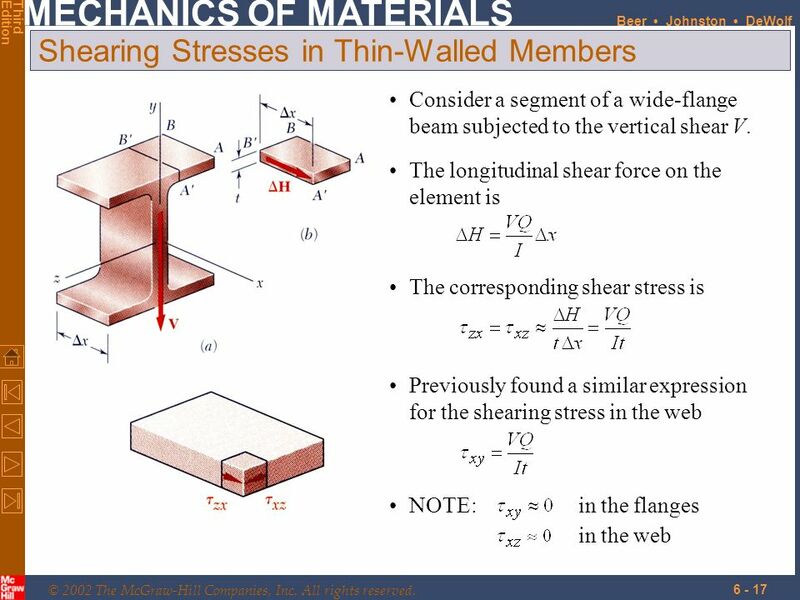 The average shearing stress on the horizontal face of the element is obtained by dividing the shearing force on the element by the area of the face. On the upper and lower surfaces of the beam, tyx= 0. It follows that txy= 0 on the upper and lower edges of the transverse sections. 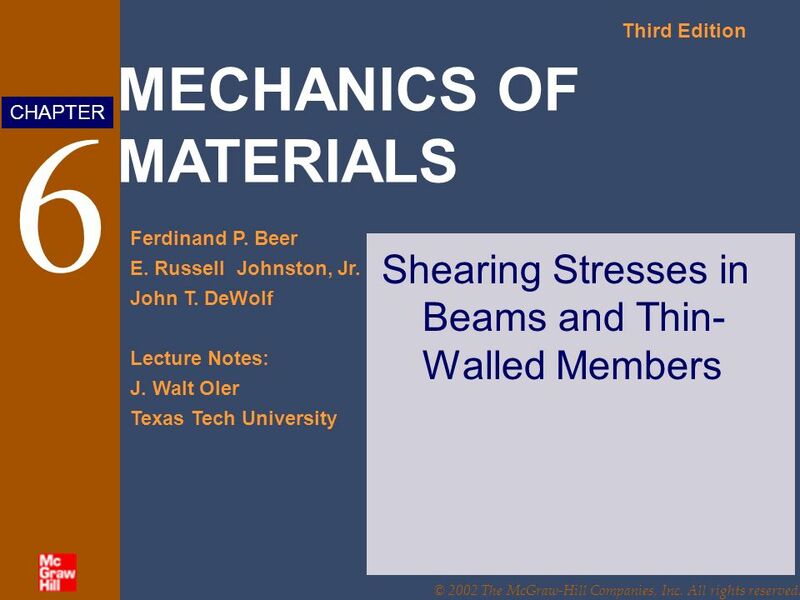 If the width of the beam is comparable or large relative to its depth, the shearing stresses at D1 and D2 are significantly higher than at D.
Consider a narrow rectangular cantilever beam subjected to load P at its free end: Shearing stresses are independent of the distance from the point of application of the load. Normal strains and normal stresses are unaffected by the shearing stresses. From Saint-Venant’s principle, effects of the load application mode are negligible except in immediate vicinity of load application points. 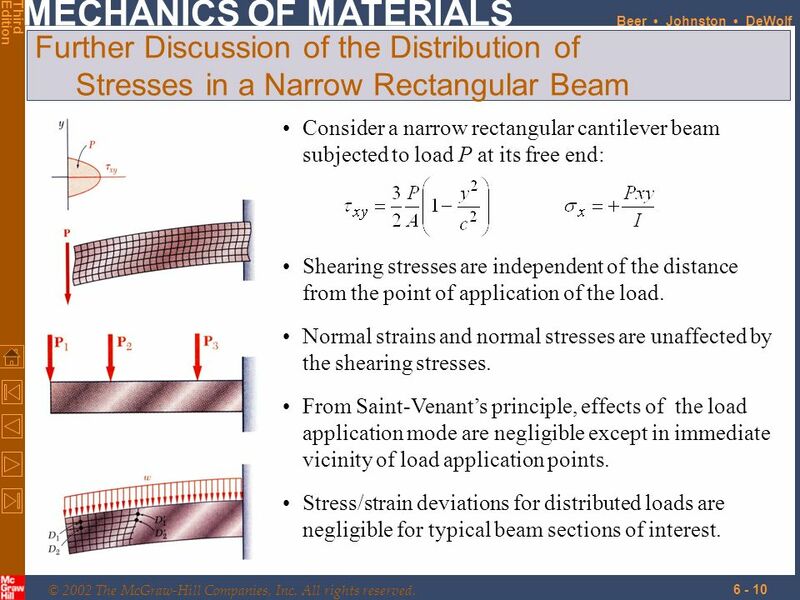 Stress/strain deviations for distributed loads are negligible for typical beam sections of interest. 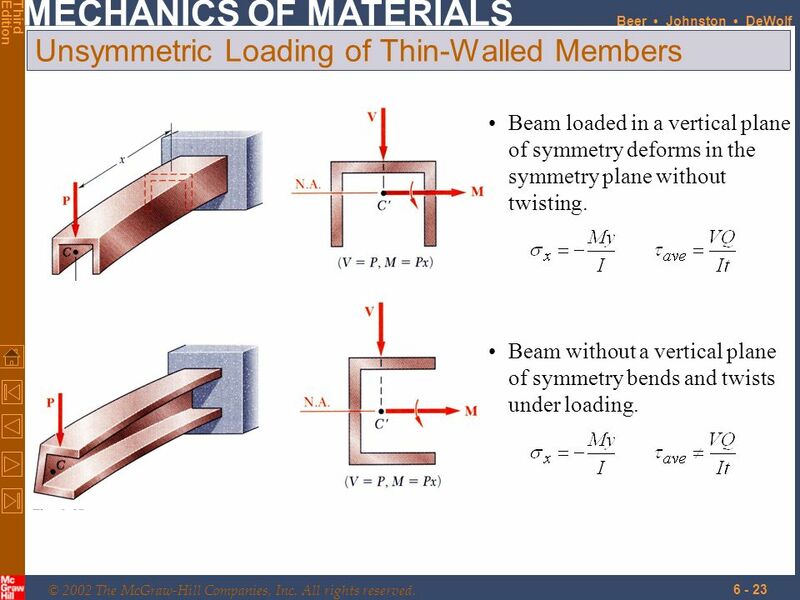 Develop shear and bending moment diagrams. Identify the maximums. 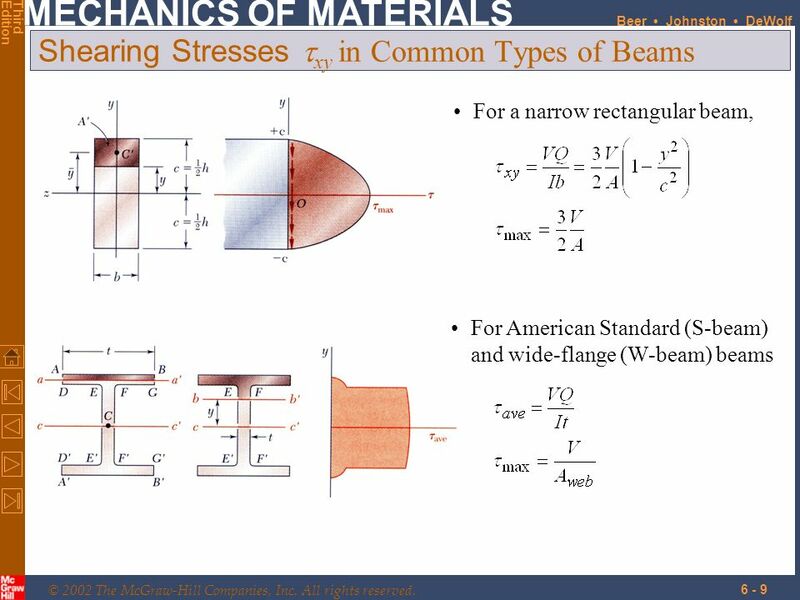 Determine the beam depth based on allowable normal stress. A timber beam is to support the three concentrated loads shown. 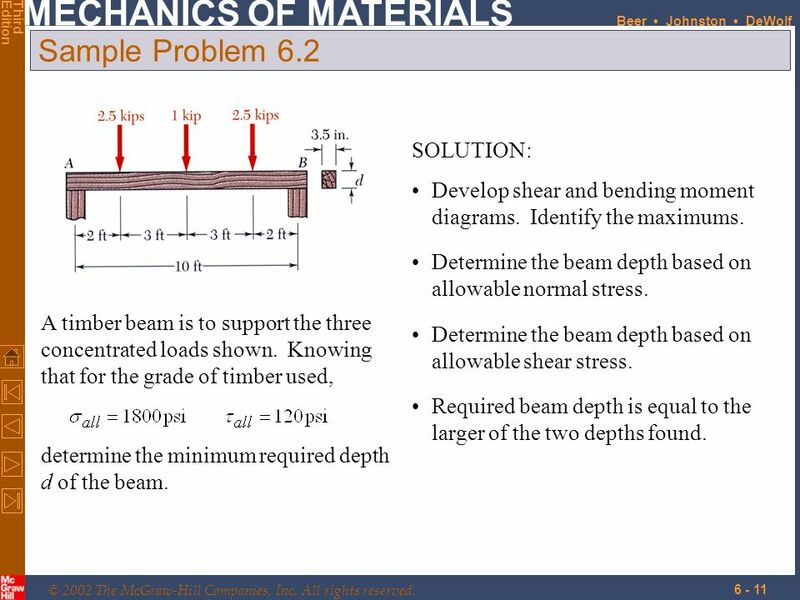 Knowing that for the grade of timber used, Determine the beam depth based on allowable shear stress. 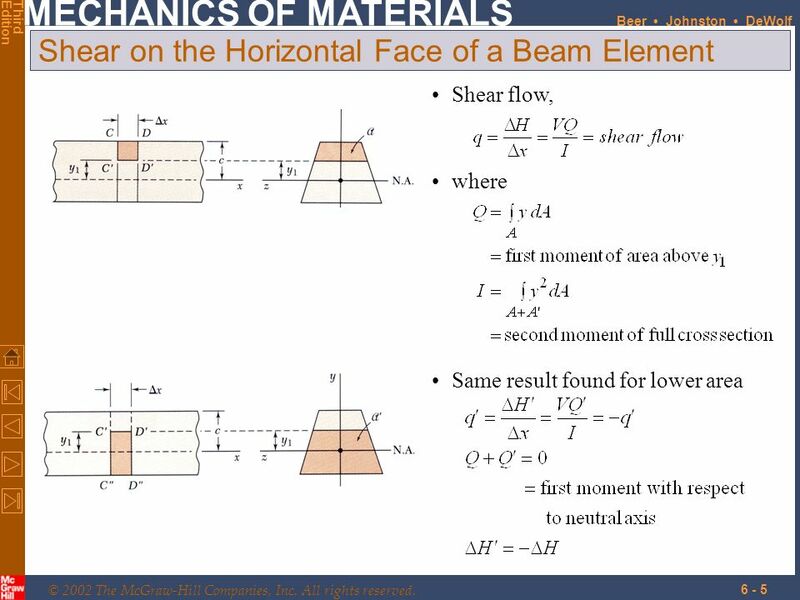 Required beam depth is equal to the larger of the two depths found. 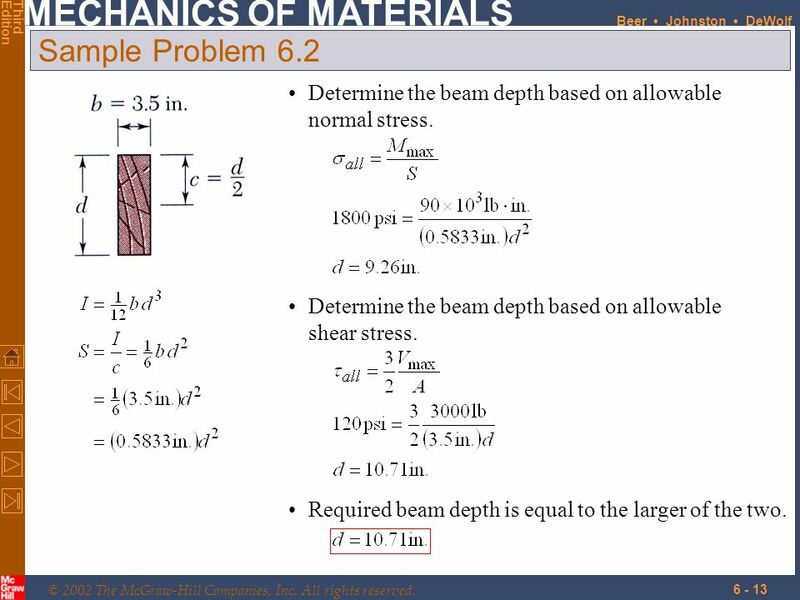 determine the minimum required depth d of the beam. 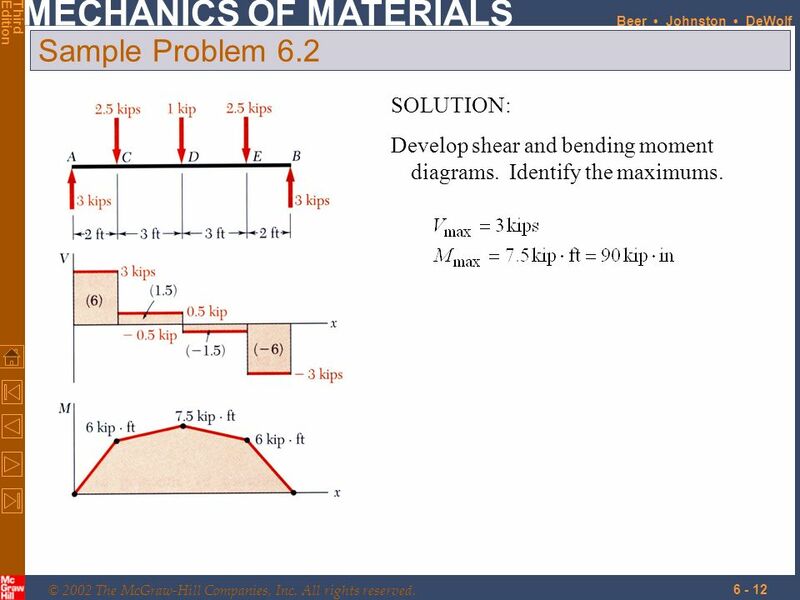 Develop shear and bending moment diagrams. Identify the maximums. 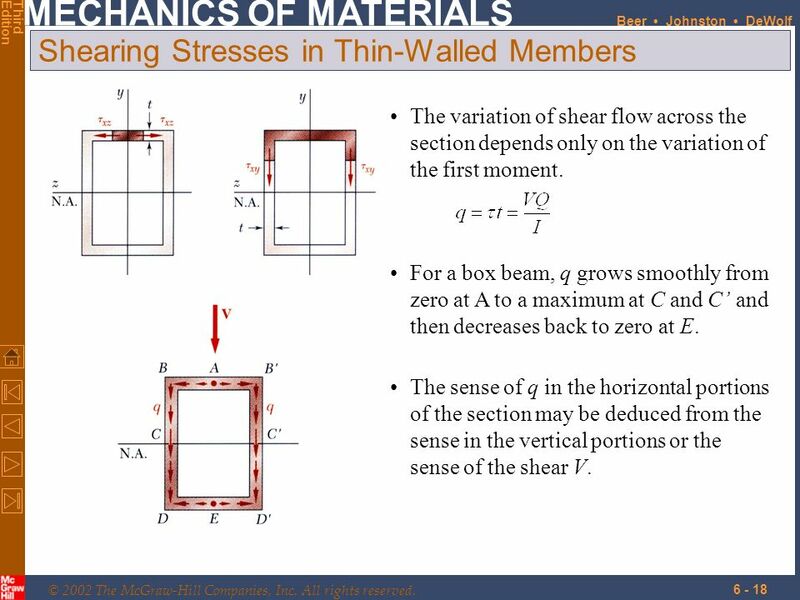 13 Sample Problem 6.2 Determine the beam depth based on allowable normal stress. 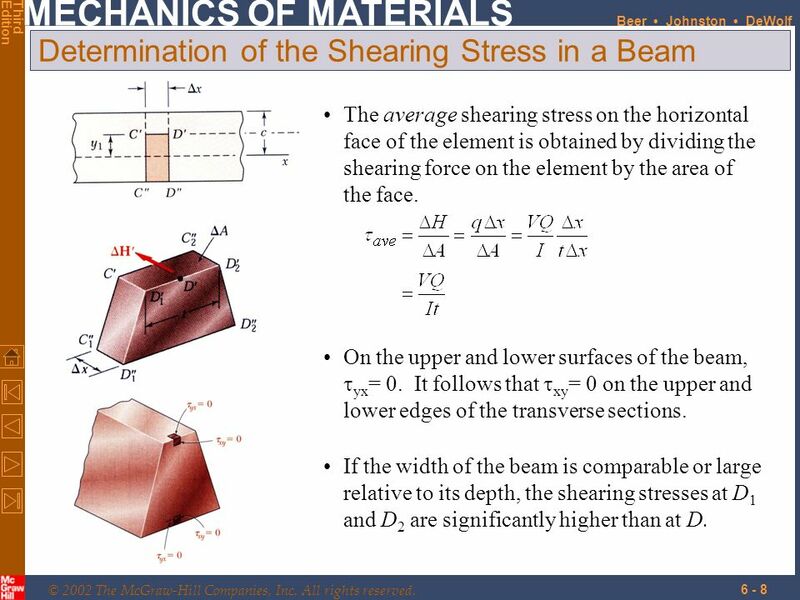 Determine the beam depth based on allowable shear stress. 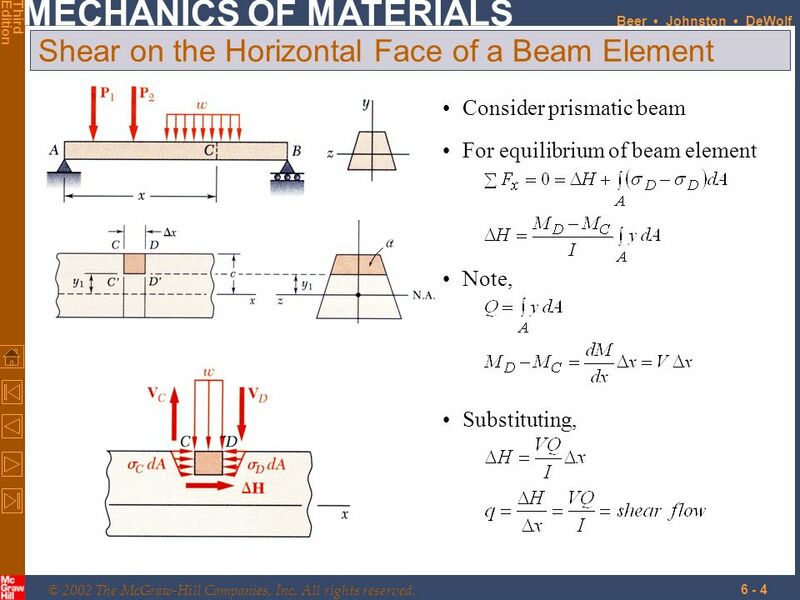 Required beam depth is equal to the larger of the two. 15 Example 6.04 SOLUTION: Determine the shear force per unit length along each edge of the upper plank. 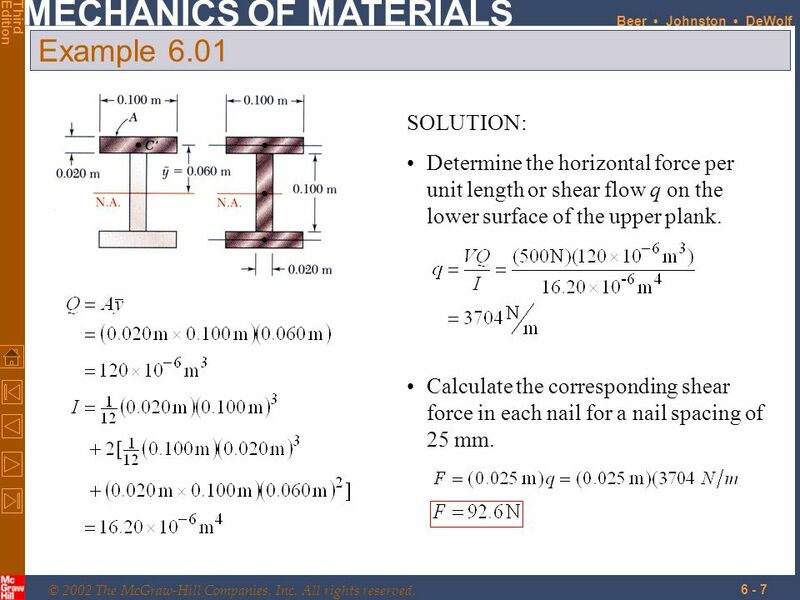 Based on the spacing between nails, determine the shear force in each nail. A square box beam is constructed from four planks as shown. Knowing that the spacing between nails is 1.5 in. and the beam is subjected to a vertical shear of magnitude V = 600 lb, determine the shearing force in each nail. 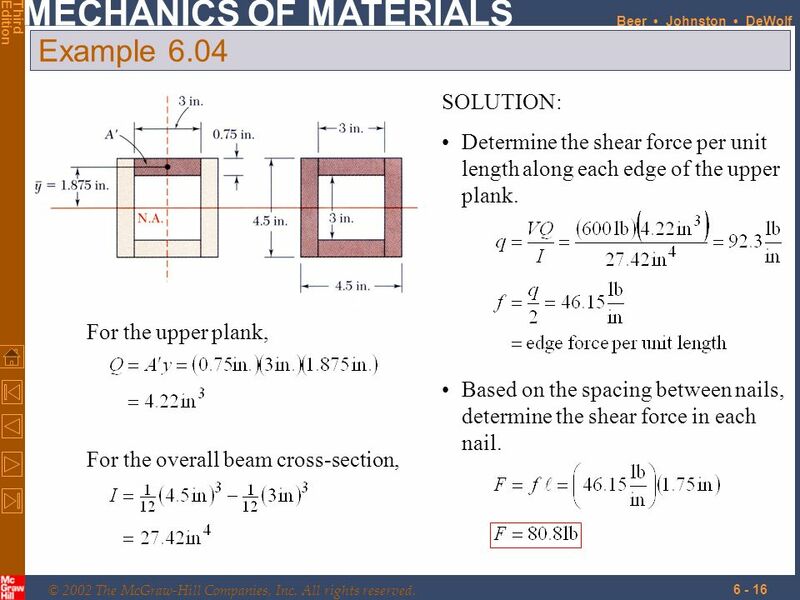 16 Example 6.04 SOLUTION: Determine the shear force per unit length along each edge of the upper plank. For the upper plank, For the overall beam cross-section, Based on the spacing between nails, determine the shear force in each nail. 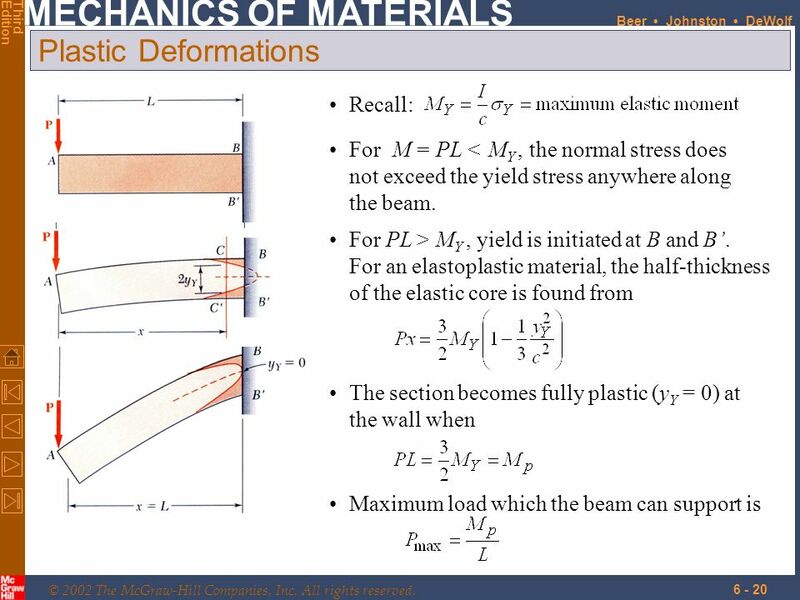 The variation of shear flow across the section depends only on the variation of the first moment. 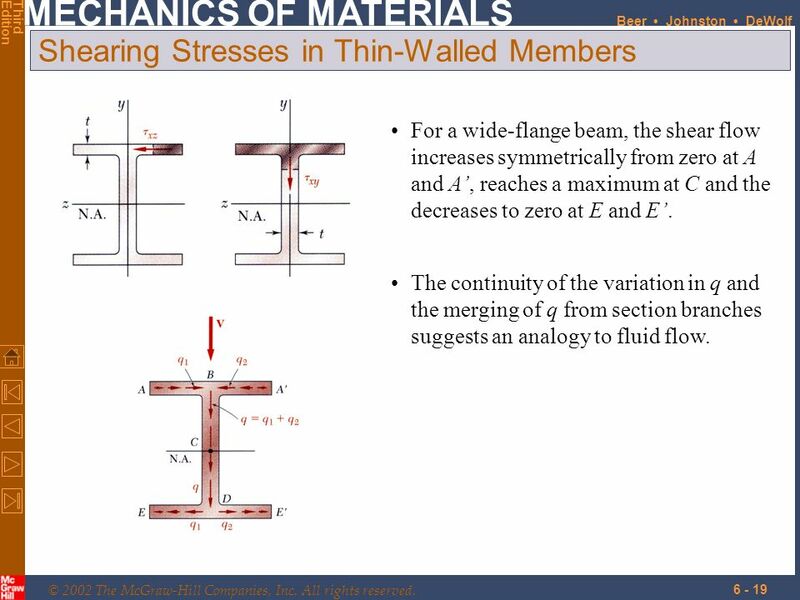 For a box beam, q grows smoothly from zero at A to a maximum at C and C’ and then decreases back to zero at E. The sense of q in the horizontal portions of the section may be deduced from the sense in the vertical portions or the sense of the shear V.
For a wide-flange beam, the shear flow increases symmetrically from zero at A and A’, reaches a maximum at C and the decreases to zero at E and E’. The continuity of the variation in q and the merging of q from section branches suggests an analogy to fluid flow. 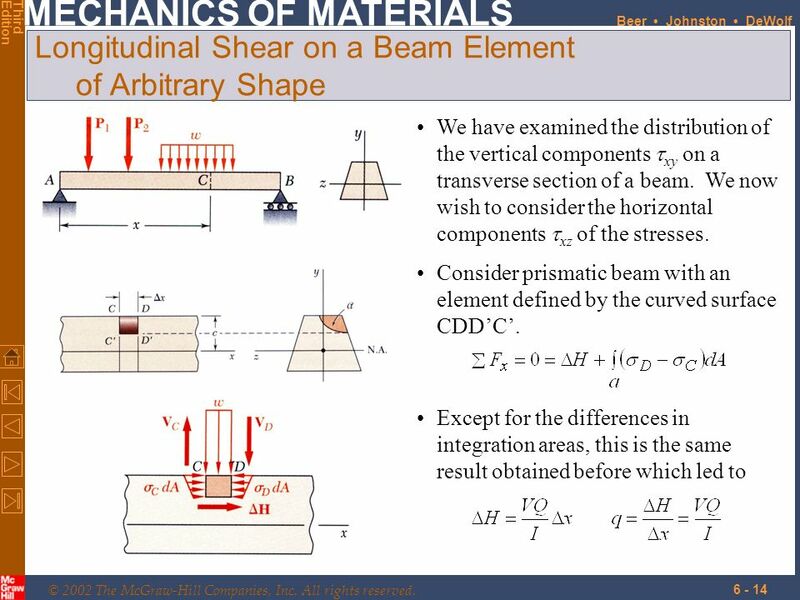 The shear stress at a, Knowing that the vertical shear is 50 kips in a W10x68 rolled-steel beam, determine the horizontal shearing stress in the top flange at the point a.
Beam loaded in a vertical plane of symmetry deforms in the symmetry plane without twisting. Beam without a vertical plane of symmetry bends and twists under loading. 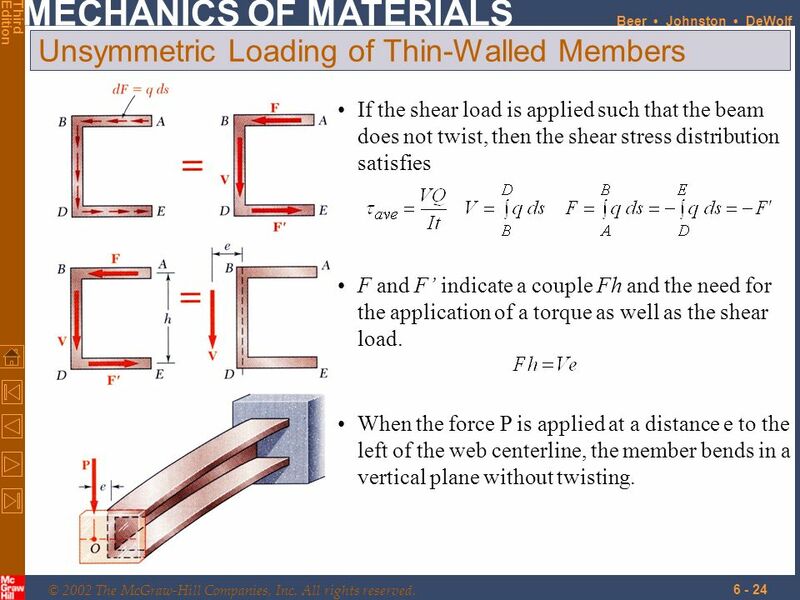 If the shear load is applied such that the beam does not twist, then the shear stress distribution satisfies F and F’ indicate a couple Fh and the need for the application of a torque as well as the shear load. When the force P is applied at a distance e to the left of the web centerline, the member bends in a vertical plane without twisting. 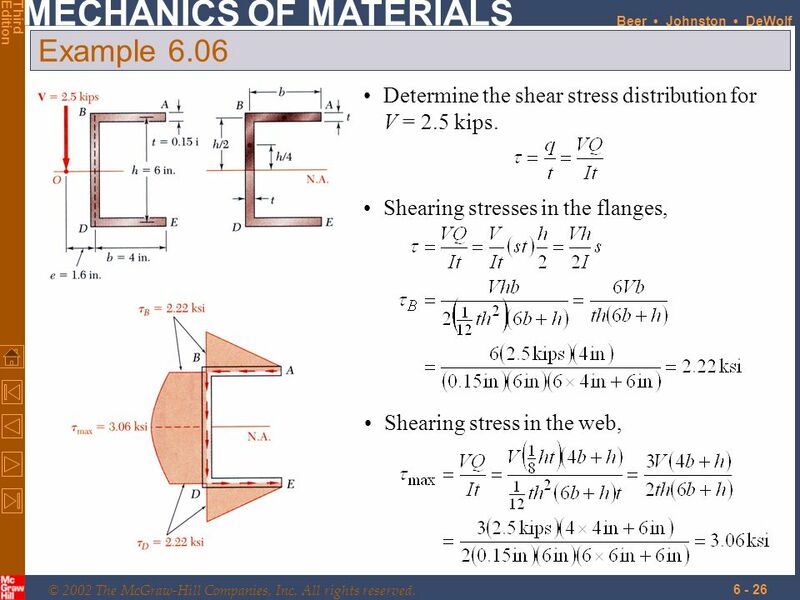 26 Example 6.06 Determine the shear stress distribution for V = 2.5 kips. 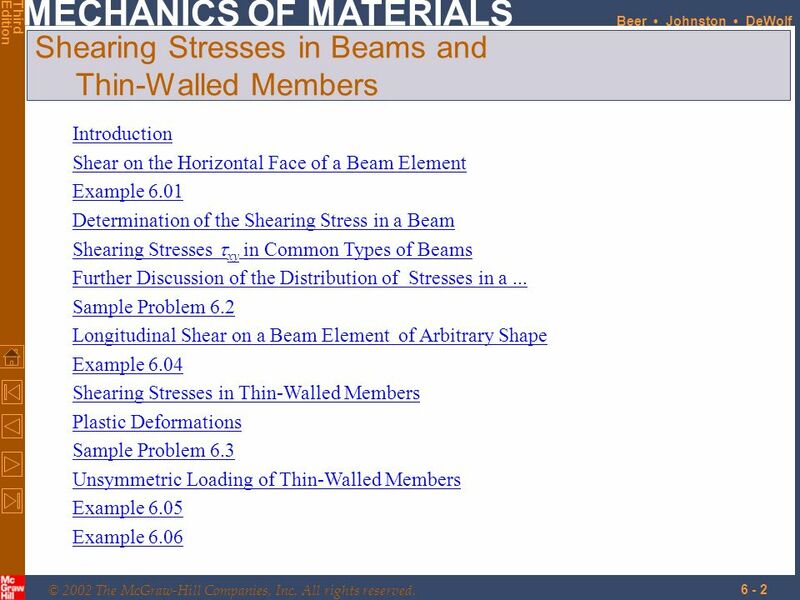 Download ppt "Shearing Stresses in Beams and Thin-Walled Members"